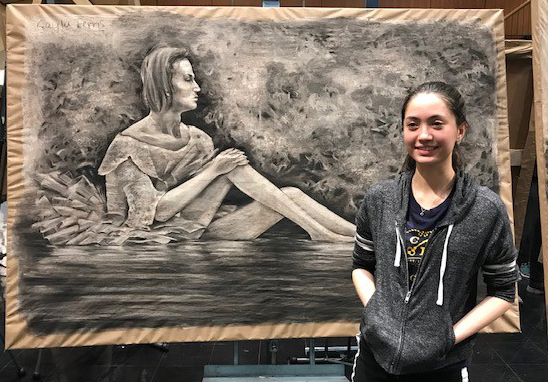 Chenango Valley High School senior Kayla Ferris displayed her artistic skills as she participated in a 24-hour drawing marathon at the Binghamton University Art Museum. As one of 14 participants selected, starting at 10:00 a.m. on April 5 and continuing until 10:00 a.m. on April 6, Kayla worked with charcoal medium to depict a live model posed at the center of the museum. While short breaks were given, the artists and model stayed the entire 24 hours to complete the event. Chenango Valley is very proud of Kayla for her hard work, talent and determination! According to the Binghamton University website, the marathon was sponsored by the Binghamton University Department of Art and Design, United Health Services, the Fleishman Career Center for Career and Professional Development and the Vice Provost’s Office for Undergraduate Education.